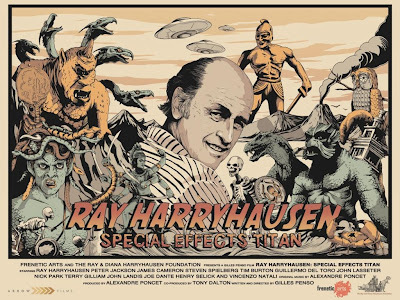 Movie Ramble: Ray Harryhausen: Special Effects Titan. 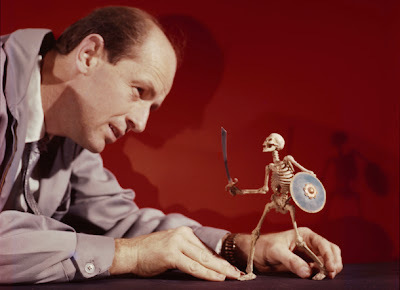 Ray Harryhausen: Special Effects Titan. Following on from last weeks Robert Burns Centre Film Theatre Film Club showing of Jason and the Argonauts (1963) we where very fortunate to be able to conduct a question and answer session via Skype with the co-producer of tonight’s documentary Ray Harryhausen: Special Effects Titan (2012). 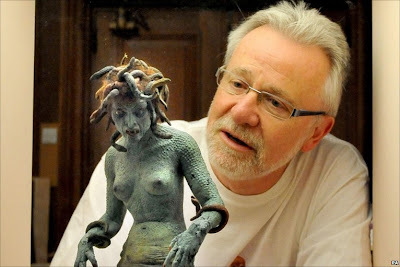 Tony Dalton is a writer and film historian who has known Ray Harryhausen for over thirty years. They met whilst Tony was working for the British Film Institute and have been close friends ever since. Tony has worked as a film publicist, television researcher and producer. Today, in addition to writing, he is a consultant to The British Academy of Film & Television Arts (Bafta). He is also curator of the Ray & Diana Harryhausen Foundation and the author of ‘Ray Harryhausen: An Animated Life’ (2009). The documentary is about the life and work of one of cinema’s great innovators, movie special effect artist Ray Harryhausen. Again our host for the evening is Film Club regular Mr Steven Pickering who very courageously volunteered to carry out the RBC’s very first feature film Q&A to be transmitted via the modern technology of Skype. A service which allows users to communicate with each other anywhere in the world by using a microphone to speak and a webcam device to see each other, in our case the complete cinema audience. A young Harryhausen working on the famous fighting skeletons. Last week’s introduction was mainly about the technical process known as stop motion which Steve hoped would help the film theatre audience unravel some of the mysteries of this time consuming procedure. Steve hoped that tonight’s documentary would help fit this process into the history of filmmaking and allow us to understand how ground breaking and influential Ray Harryhausen’s work was to movie making in general and to moviemakers like Steven Spielberg, James Cameron and Peter Jackson. Steven went on to tell us that when the end credits roll on todays movies we often see a great long list of special effects technicians, artists and consultants but on 15 fantasy/sci fi movies made between 1953 and 1981 we will possible see only one name credited with the special effects and that name is: Ray Harryhausen. 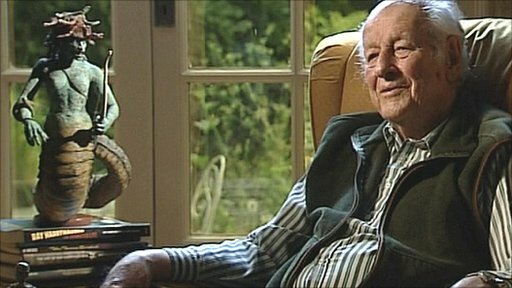 Ray Harryhausen at home in the UK. The documentary shows clips from his films as well as interviews with him shot over ten years, also we get conversations and tributes from amongst others his daughter Vanessa, Peter Jackson, Nick Park, Terry Gilliam, John Landis, Joe Dante, John Lassiter, Guillermo Del Toro and of course James Cameron who all sing the praises of this influential animator and admit that without Harryhausen and his stop motion they would have not gone on to make their own movies. We hear some great stories when he reveals for instance that when making It Came from Beneath the Sea in 1955 the San Francisco authorities disapproved of the narrative that a giant octopus could pull down the Golden Gate Bridge and that the films budget restricted the octopus to have only six tentacles. We hear that he was influenced himself by Gustave Dore, Georges Melies and the great Willis O’Brien whom Harryhausen assisted on the award winning Mighty Joe Young (1949). We also find out some of the secrets behind his famous creations, always referred to as creatures and never as monsters. In addition the documentary uses previously unseen footage of tests, experiments and dailies found in London and during the clearance of his old LA garage. My only criticism with this wonderful documentary is that it may be a bit to long, made worse by a little too much fan worship from the good and the great. I would have liked to see more clips and if possible more film of the great man working on his creations and movies. The evening continued with the Skype Q&A when Tony Dalton was happy to answer questions put to him by Steve and one or two members of the audience. These generally clarified items raised in the documentary. But we did learn that it was two French men, Gilles Penso the director and Alexandre Poncet the producer, that first muted the film, it took 3 years to make and seven months to secure clearances and approvals. Tony explained that he first met Ray when researching an article for the BFI and they quickly became firm friends. Ray settled in the UK in the sixties where he met and married his wife Diana in 1963. The 14 boxes of movie artifacts from the LA garage brings the Harryhausen collection up to 50000 items which the Foundation is hoping to permanently have on display at the Media Museum in Bradford. We also learned that Peter Jackson restored most of Ray’s best movies and did not take a penny for his troubles. This memorable evening ended with thanks offered to both Tony Dalton for his good humoured interview and to Steven Pickering for the fantastic job he did in conducting it. Although I must say that for me the best part was seeing one of the fighting skeletons from Jason up close!! 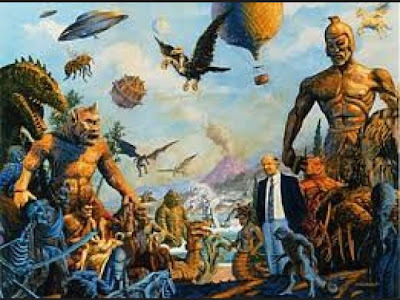 A montage of Harryhausen creatures. The discussion as always was filmed by Alec Barclay and he kindly provided some stills as follows. Your blogger with RBC's Alex Murray and Steven Pickering. Steve looking deservedly pleased with him self after a great Q&A with Tony Dalton.